Come to Asgard and discover the abundance of Norse treasures with this mythology themed online casino video slot from iSoftBet. Play Legend of Loki on any device of choice from a bet as low as €0.20 and expect returns of up to 2,083 times your stake. The base game is fired up by three 3 modifiers that either award extra wilds and extra re-spins, or transform symbols. What starts as just another 5 reels, 3 rows, and 20 payline video slot, ends up offering a thrilling new experience. First, there is the stylish feature of the symbols spinning in their place, instead of the whole reels spinning. Then there are the amazing animations during the bonus levels and the superb graphics. The A to 10 playing cards and 4 Norse gods symbols are set against a simple rural backdrop. The highest paying one is Loki who will grant 2.5, 5 or 25 times your stake if you land 3, 4 or 5 on a payline. The Hammer is the wild and replaces all other symbols except for the Scatter. The latter grants payout of 3, 5 or 10 times your total stake when you land 3, 4 or 5. 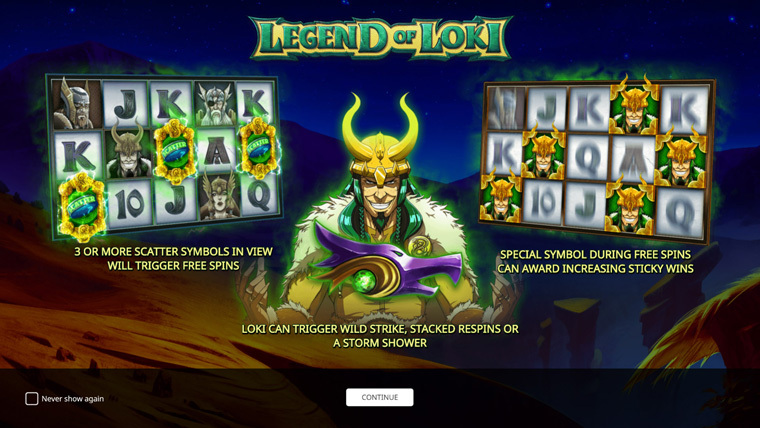 Legend of Loki also has a Free Spins built-in bonus level. To reach it, land 3 to 5 Scatter and you will be awarded 10 such freebies. The RTP of this video slot is 96.23%, while the variance is medium high.